Link is the main protagonist of the The Legend of Zelda series created by Nintendo. Over the course of the series, many different incarnations of Link have existed, chosen by the Goddesses of Hyrule to protect the land from evil. Each incarnation of him bears the Triforce of Courage, and usually has to fight Ganon and save Hyrule and its ruler, Princess Zelda. Being one of the most popular Nintendo video game characters alongside Mario, Link has had several crossover appearances within the Mario franchise. 1.4.2 Donkey Kong Country 3: Dixie Kong's Double Trouble! Link as a traveling guide. Link's first appearance in the Mario series is the coloring game Super Mario Bros. & Friends: When I Grow Up. He first appears on the "Chef" page, where he is shown waiting for a pasta dish cooked by Mario. He later appears on the "Travel Guide" page, which depicts him owning a travelling agency. Several enemies from The Legend of Zelda series also make appearances in the other career pages. Link as seen in the Club Nintendo comic "Mario in Mariozilla". Link also makes several appearances in the Mario-based comics within the German Club Nintendo magazine, his appearance based upon that in the original The Legend of Zelda. He debuts in "Super Mario: Die Bescherung", celebrating a Christmas party in the Mario Bros.' House. His role in this story is minor, though he has a brief speaking part at the end, mistrusting the realness of Santa Claus. In "Warios Weihnachtsmärchen", Link appears in the role of the Ghost of Present. Like in the story it is based on, Link takes Wario to see those he had upset earlier. In "Mario in Mariozilla", he is seen in the Empire State Building, studying a map together with Dr. Light, who lives there. Link's actual role is unknown, though it appears that he works as Light's assistant. He also comments on a "magic cap" Light gave to Mario in order to make him incognito - actually a simple paper bag pulled over his head - in the way that it "becomes" him. Link, alongside Kirby, is Mario's ally in the comic "Super Mario in Die Nacht des Grauens". During the events of this story, he lives in a Brooklyn skyscraper and fights against Abigor and his demonic fellows who plan to take over the building. He does so by making use of a magic serum which turns him and his allies into aggressive ghostbusters. In this form, he has green skin, black armor and a fire sword. Link received his own television show with The Legend of Zelda, produced by DiC Entertainment. It aired under the The Super Mario Bros. Super Show! syndication, with the animated Mario segments running Monday through Thursday, and being replaced by Zelda segments on Fridays. The Zelda segments still received an accompanying live-action Mario and Luigi short. The series revolved around Link and Princess Zelda protecting the Triforce of Wisdom from Ganon. Jonathan Potts voiced Link in the series. 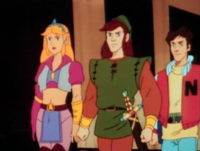 Link and Zelda appear in Captain N: The Game Master, borrowing their appearance and personality from the aforementioned Legend of Zelda cartoon. Jonathan Potts returned to voice Link in the series. Link was also a major character in the Valiant Nintendo Comics System line of Captain N: The Game Master. 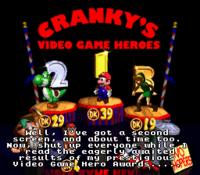 In Donkey Kong Country 2: Diddy's Kong Quest, Link is by default ranked at third place on a podium at Cranky's Video Game Heroes. Mario comes in first place, while Yoshi comes in second place. Link managed to obtain 19 of them, and Diddy Kong can remove him from the podium entirely by collecting more DK Coins than him. By doing so, Link's tunic appears in the trash can at the "NO HOPERS" sign. Link also appears in the Video Game Heroes in the ending for Donkey Kong Land 2, where he has the same number of DK Coins collected as before. In the Game Boy Advance port, Link and Yoshi's positions are swapped; additionally, Link has obtained 50 DK Coins in total. This means that Diddy can only shift Link down to third place, therefore removing Yoshi from the podium. In Donkey Kong Country 3: Dixie Kong's Double Trouble!, if the Kongs ask [Bazaar]] who owns the castle in the Northern Kremisphere, Bazaar tells a short story of when Link visited his General Store the week before. Link also asked Bazaar for information regarding the castle even though he had insufficient Bear Coins, but Bazaar thought him nice enough that he accepted a payment of 500 rupees instead. After being told the information, Link left, grumbling about the seashells being the wrong shape (a nod to the Secret Seashell sidequest in The Legend of Zelda: Link's Awakening). This dialogue was removed in the Game Boy Advance port, where Bazaar instead discusses what he personally saw at Kastle KAOS. Link sleeping at the Rose Town Inn in Super Mario RPG: Legend of the Seven Stars. In Super Mario RPG: Legend of the Seven Stars, Link can be found resting at the Rose Town Inn. He does not awaken when spoken to (likely a nod to Link's constant portrayal as a silent protagonist), but rather a melody from Zelda series will play, the same melody as when a player uncovers a secret. Link appears in all released Super Smash Bros. games as a default playable character. Most of Link's standard attacks make use of the Master Sword, while his specials are all attacks or items from The Legend of Zelda series. Link's artwork from Super Smash Bros. In Super Smash Bros., Link's design is based on Adult Link from The Legend of Zelda: Ocarina of Time. Link is the first character fought in single player mode, on Hyrule Castle. Link's standard special move in this game is the Boomerang, in which Link tosses a boomerang to damage opponents. His up special move is the Spin Attack, in which he spins around rapidly to deal damage; and his down special is Bomb, in which Link pulls out a bomb to throw. In addition, Link's grab move uses the Hookshot, an item also taking its appearance from Ocarina of Time that can also be used as a wall grapple. Link's up and down aerials are the Jump Thrust and Down Thrust, both of which originated in Zelda II: The Adventure of Link. Two of Link's alternate colorations in this game are based upon the Goron and Zora Tunics from The Legend of Zelda: Ocarina of Time, while his final coloration is based upon his outfit after collecting the Blue Ring in the original The Legend of Zelda. 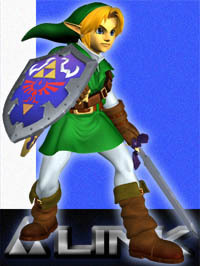 Link as he appeared in Super Smash Bros. Melee. In Super Smash Bros. Melee, Link retains his The Legend of Zelda: Ocarina of Time appearance, though some of his moves have been changed. His standard special attack has been replaced with the Bow, which lets Link shoot an arrow that can be charged; the boomerang has instead been made his side special move. His other specials are kept the same, as has the Hookshot. Starting with this game, Link can also use the Hylian Shield he carries to defend from projectile attacks while standing still. In the game's Adventure Mode, Link is fought in the Underground Maze stage. He can be found at fake pedestals for the Master Sword (wearing a different tunic each time) as fighters search for the Triforce to end the level. Young Link, Link's child self from The Legend of Zelda: Ocarina of Time, is also a separate playable character, much in the same manner that Mario and Baby Mario often appear in the same game. Additionally, a doppelganger of Link, known as Dark Link, appears in Super Smash Bros. Melee as the opponent in Event Match 18: Link's Adventure. In the battle, the player controls a red-clad Link, who has two extra lives. The fighter must defeat Dark Link, who also has two lives. The two swordsmen are fought at the Temple, with no time limit. This Event Match is a reference to the ending of Zelda II: The Adventure of Link, where a similar Dark Link served as the game's final boss. Link was the first character to be announced for Super Smash Bros. Brawl. His appearance and moveset in this game have been changed to reflect those of their appearance in The Legend of Zelda: Twilight Princess; the bow (now called "Hero's Bow") and bombs have been aesthetically swapped to match their Twilight Princess appearances, while the boomerang has been replaced with the Gale Boomerang, which generates a whirlwind that can drag in opponents as it returns. The Hookshot has also been replaced with the Clawshot from Twilight Princess, which, when used offstage, can home in on ledges and grab them unlike the Hookshot; however, it is now a tether recovery as opposed to a wall grapple. Link has a new voice actor in Super Smash Bros. Brawl, Akira Sasanuma, who voiced him in Twilight Princess. Dark Link is also in the game, both as one of Link's alternative colors and as an opponent in an Event match. Toon Link, the Link incarnation from The Legend of Zelda: The Wind Waker, also appears in the game as a playable character, with a similar moveset to Link's. Dark Link also reappears in this game, where he returns in two Event Matches. The first, Event Match 18: Dark Link Duel, is similar to the match from Melee, but it is fought on the Bridge of Eldin instead, and is a stamina match rather than using lives. The second, Co-Op Event 7: Battle of the Dark Sides, is the same as Dark Link Duel, but with the addition of Samus Aran and Dark Samus assisting Link and Dark Link, respectively. Versions of Dark Link also appear as palette swaps for both Link and Toon Link. Link's is based off the "interlopers" from The Legend of Zelda: Twilight Princess, whereas Toon Link's is based off Shadow Link from The Legend of Zelda: Four Swords Adventures. While walking through a forest, Links finds the Master Sword. Taking it in hand, he meets up with Yoshi, forming an alliance. They later meet Mario and Pit, though under circumstances where Mario/Link defeats an evil copy of Zelda/Peach, leading to a fight. The two groups come to an understanding (and Kirby joins up as well) and unite as they see King Dedede driving off with Ness, Luigi, and the captured Princess. They come to Dedede's base, only to find that Bowser has beaten them to it, taking the Princess off in his Koopa Clown Car. The team grows in size as they meet with Ike, Marth, Lucas, the Pokémon Trainer, and the Ice Climbers. The remaining heroes join them as they enter Subspace. Link is among the many that falls to Tabuu's Off Waves, only to be revived by Kirby. He and Zelda come across Ganondorf's trophy and revive him, forming a temporary alliance as everyone teams up to defeat Tabuu. Link reappears in Super Smash Bros. for Nintendo 3DS and Super Smash Bros. for Wii U as a playable character along with Toon Link. He retains the design from his incarnation in The Legend of Zelda: Twilight Princess, though with a brighter color scheme than that of Super Smash Bros. Brawl and Twilight Princess. 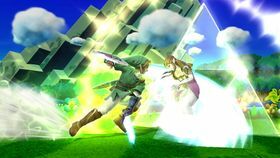 Link retains much of his moveset from the previous game, though some of his non-special moves have been altered, such as his down aerial gaining a meteor smash effect and being given a new dash attack, which is the Jump Slash. Link's shield can also block projectiles while walking in this game. Link keeps all of his alternate costumes from Super Smash Bros. Brawl, while gaining two more: one based on the clothes he wears at the beginning of The Legend of Zelda: Skyward Sword, and another based on Fierce Deity Link, a transformation obtained at the end of The Legend of Zelda: Majora's Mask. Link returns as a playable character in Super Smash Bros. Ultimate, as well as Young Link and Toon Link. This time, his appearance is based on his design from The Legend of Zelda: Breath of the Wild. As a result, Link takes on many different stances during battle (though this is just cosmetic); additionally, his Master Sword is longer and larger, increasing the reach in his attacks. The Nintendo E3 2018 reveal shows Link donning the Tunic of the Wild, which resembles Link's classic design, as one of his costumes. 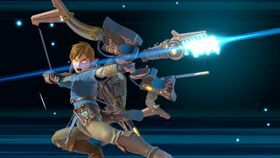 Link has received some alterations to his moves, namely a new down special move, which uses the Remote Bomb Rune, and a new Final Smash which involves an Ancient Bow and Ancient Arrow. Additionally, as neither the Hookshot nor the Clawshot appears in The Legend of Zelda: Breath of the Wild, Link's grab is now a regular, direct grab, and he can no longer execute a tether recovery. Link has received many improvements when compared to the previous installment, such as increased mobility, reduced short hop timing, decreased landing lag in his aerials, reintroduction of the directional air dodge, using aerials on ladders, and dash canceling any ground attack. Link's damage output is better overall, with a prime example being the addition of a projectile hitbox to his forward smash when at 0%. Link's jumps are both higher, while he now leans when performing attacks, giving them greater range, yet making his hurtbox more vulnerable to attacks. Link's dash attack and up and down aerials are now referred to their names in-game, while his forward smash is now called Sword Slice. By completing Link's Classic Mode route, it is possible to unlock King K. Rool, Ice Climbers, Simon, Meta Knight, Snake, Young Link, Richter, or Toon Link. Link's Classic Mode route pits him against characters that are in some way associated with darkness, with the fight against the dark-costumed Link being a reference to Dark Link. The Boomerang is a recurring item throughout The Legend of Zelda series that appears as Link's standard special move in Super Smash Bros., and as his side special move in Super Smash Bros. Melee and Super Smash Bros. Ultimate. Originally designed after the Boomerang in The Legend of Zelda: Ocarina of Time, in Super Smash Bros. Melee, the move is also used by Young Link, who uses the same Boomerang. In Super Smash Bros. Ultimate, Link's Boomerang is the same one from The Legend of Zelda: Breath of the Wild. When the move is used, the player throws a Boomerang at opponents that can damage them, automatically returning to the player once it hits an opponent or wall. The player can hold the control stick to make it fly farther, and can also be thrown diagonally. The Boomerang can also fly up or down while it is active by tilting the control stick just before throwing it. In later games, the move is used by Toon Link, whose design of the Boomerang is based on that in The Legend of Zelda: The Wind Waker. The Hero's Bow (simply referred to as Bow in Super Smash Bros. Melee) is Link's standard special move from Super Smash Bros. Melee through to Super Smash Bros. for Nintendo 3DS / Wii U, replacing the Boomerang from Super Smash Bros. The move is based upon the recurring Bow item throughout The Legend of Zelda series. In Super Smash Bros. Melee, Link's Bow is based on the Fairy Bow in The Legend of Zelda: Ocarina of Time; in the later games, Link's Hero's Bow takes its design from The Legend of Zelda: Twilight Princess. When used, Link fires an arrow from the bow at opponents to damage them. The player can charge the attack to increase the distance the arrow travels and its damage output by holding down the special move button. 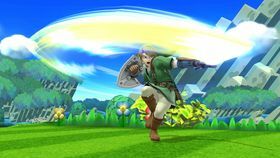 In Super Smash Bros. for Nintendo 3DS and Super Smash Bros. for Wii U, Link's first custom variant for this move is the Power Bow, which has less range than normal but increases the power of the arrow. His second is the Quickfire Bow (parsed Quick-Fire Bow in PAL regions), which allows Link to fire arrows more quickly that can travel through opponents. The Bow and Arrows are Link's standard special move in Super Smash Bros. Ultimate, replacing the Hero's Bow from previous games. For this move, he uses the Traveler's Bow from The Legend of Zelda: Breath of the Wild instead, which functions the same as the Hero's Bow, except this time, after an arrow is fired and it lands on the ground, it lingers rather than disappear after a period of time. Link can then pick it up and throw it at opponents, or press the special move button again to draw two arrows at once, which deal double damage. The Gale Boomerang is Link's side special move in Super Smash Bros. Brawl, Super Smash Bros. for Nintendo 3DS and Super Smash Bros. for Wii U, based on the Gale Boomerang item from The Legend of Zelda: Twilight Princess and replacing the Boomerang from the previous games. When used, the Gale Boomerang generates a whirlwind; the attack hurts opponents when thrown, and the whirlwind draws opponents and small items in as it returns, though it deals no damage. Like the previous Boomerang, it returns to Link automatically once it hits an opponent or a wall, and the Gale Boomerang can also be thrown at an angle. 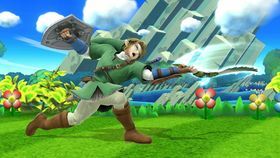 In Super Smash Bros. for Nintendo 3DS and Super Smash Bros. for Wii U, Link's first custom variant for this move is Boomerang, which gives it similar properties to Link's previous Boomerang move, meaning that it does not pull in opponents. The second is Ripping Boomerang, which makes the attack slower and gives it a shorter range, but allows it to pass through opponents as it flies out and deals multiple hits rather than having the whirlwind property. The Spin Attack is Link's up special move in every installment of the Super Smash Bros. series. The move is based on the Spin Attack move recurring throughout The Legend of Zelda series. When used, Link spins around rapidly with their sword to deal damage. When used in the air, the move also gives Link some vertical and horizontal distance. In Super Smash Bros. Brawl onward, the move can be charged by holding down the special attack button when used on the ground to deal more damage. In Super Smash Bros. for Nintendo 3DS and Super Smash Bros. for Wii U, Link's first custom variant for this move is Shocking Spin, which gives the attack more power and deals electric damage, but it covers less distance than Spin Attack, and its ending lag is longer as well. Link's second variant is Whirling Leap, which greatly improves Link's recovery by giving him more vertical height, and his horizontal mobility is increased drastically during the move's duration as well. However, the move does not deal any damage, nor can it be charged, so its only use is for recovery. When used on the ground, Link leaps up to perform the move. The Bomb is Link's down special move throughout the Super Smash Bros. series up until Super Smash Bros. Ultimate, and based on the item recurring throughout The Legend of Zelda series. 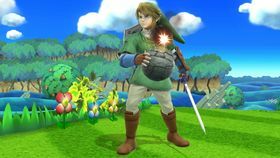 When used, Link pulls a Bomb out that can then be thrown at other characters to do damage, exploding on impact. Like other explosives, the Bombs also deal damage to the holder; it can also be caught and thrown by opponents, or detonate in the player's hands. The player cannot use the move while holding another item, as the Bombs count as an item. In Super Smash Bros. for Nintendo 3DS and Super Smash Bros. for Wii U, the first custom variant for this move is Giant Bomb, which gives Link a larger Bomb that deals more damage and has a larger blast radius, but does not automatically explode upon impact. The second is Meteor Bomb, which lessens the time that the Bomb will explode and weakens it, but gives it a meteor smash property. In Super Smash Bros. and Super Smash Bros. Melee, the Bombs used by Link and Young Link are based on the ones from The Legend of Zelda: Ocarina of Time. In Super Smash Bros. Brawl, Super Smash Bros. for Nintendo 3DS and Super Smash Bros. for Wii U, however, the Bombs used by Link are based on the ones from The Legend of Zelda: Twilight Princess. The Remote Bomb is Link's down special move in Super Smash Bros. Ultimate, based on the Remote Bomb Rune from The Legend of Zelda: Breath of the Wild and replacing the Bomb from previous Super Smash Bros. games. When first used, Link produces a spherical Remote Bomb, which can then be thrown. After doing so, it can then be picked up again by Link or other fighters like an item, or knocked around with attacks. If the player activates the move again, Link detonates the Remote Bomb with his Sheikah Slate, damaging any fighters caught within the blast radius. Only one Remote Bomb can appear at a time. Triforce Slash is Link's Final Smash in Super Smash Bros. Brawl, Super Smash Bros. for Nintendo 3DS and Super Smash Bros. for Wii U. When activated, Link's Triforce on his hand glows and he fires a beam of light directly in front of him. If an opponent is in the line of fire, they will be trapped between two Triforces as Link rushes forward to deliver several sword blows. After fifteen slashes, the character rushes through the trapped opponent, launching them. If the beam of light does not reach an opponent, the attack fails. 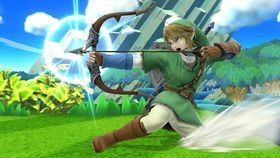 The Ancient Bow and Arrow are Link's Final Smash in Super Smash Bros. Ultimate, replacing the Triforce Slash, which is now used by Young Link as well as Toon Link. When activated, Link draws an Ancient Bow with an Ancient Arrow, which launches any opponents in front of him away. Link appears in several WarioWare games. He usually is a playable character in 9-Volt's and 18-Volt's microgames. Link, in The Legend of Zelda microgame. In WarioWare, Inc.: Mega Microgame$!, Link appears in the Legend of Zelda microgame, based on the original The Legend of Zelda game, in which the player must guide Link into a cave. In WarioWare: Twisted!, Link appears in another microgame also titled The Legend of Zelda, once again based on the original game. The object is to rotate the handheld to deflect projectiles by red Octoroks with the shield. In WarioWare: Smooth Moves, two incarnations of Link appears. In the Ocarina of Time microgame, Young Link must draw his sword from its pedestal. This turns him into Adult Link on Level 1, old Link (with a grey beard) on Level 2, and a Cucco on Level 3. In addition, in the microgame The Wind Waker, Toon Link must glide over the sea to a safe landing point with the Deku Leaf. In WarioWare: D.I.Y., Link is the main character in the Zelda microgame, appearing in his The Legend of Zelda: Phantom Hourglass incarnation. The object is to defeat Chuchus with the sword by tapping them. In WarioWare: D.I.Y. Showcase, Link is in the Zelda 2 microgame, based on Zelda II: The Adventure of Link, in which Link must deflect a Goriya's boomerangs with the shield. Portraits of Mario and Link above Tracy's throne. Though Link himself doesn't make a direct appearance in Captain Rainbow, there is a cameo of Link in the form of a portrait of him above Tracy's throne, next to a portrait of Mario. The Link picture is actually artwork from Twilight Princess. It is worth noting that Tracy is a character also from The Legend of Zelda series. In Super Mario 3D World, before the second Green Star in World Star -1, Rainbow Run, if the player walks around in a secret area, he or she will uncover an 8-bit image of Link, hidden as an Easter egg. An arrangement of the main theme of The Legend of Zelda will begin to play afterwards. Link driving a Standard Kart on Mario Circuit in Mario Kart 8. In Mario Kart 8, Link appears as a downloadable playable character in the The Legend of Zelda × Mario Kart 8 downloadable content pack, making his first playable appearance in the Mario Kart series as well as his first playable appearance in the Mario franchise altogether. Link is a heavyweight racer, although he is one of the lighter heavyweights, befitting his much taller size, though he shares his stats with Rosalina, Donkey Kong, Waluigi, and Roy Koopa. His appearance is based on that of his incarnation in The Legend of Zelda: Skyward Sword. The Master Cycle, a bike based on Link's Master Sword and his horse Epona, appears as one of four additional vehicle bodies, along with a Zelda-themed set of tires, the Triforce Tires, and a Zelda-themed glider, the Hylian Kite. A Zelda-themed course called Hyrule Circuit also appears as part of the Triforce Cup. His kart symbol is the Hylian Crest. In his tricks, he shows off the Master Sword and Triforce. Artwork of Link on the Master Cycle holding a boomerang from Mario Kart 8 Deluxe. Link reappears in the port of Mario Kart 8, Mario Kart 8 Deluxe, available as part of the core game. He is available from the start, and shares his stats with only Rosalina and King Boo. 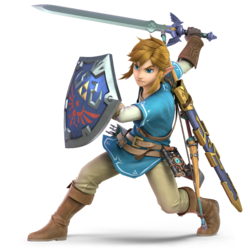 On July 19, 2018, the game updated, adding his incarnation from The Legend of Zelda: Breath of the Wild as the new default costume, relegating his old one to alternate status, as well as adding the Master Cycle Zero, Ancient Tires, and Paraglider parts. Unlike other alternate costumes, the two Links have different kart symbols, with the new look having the technological looking version of the Sheikah Eye associated with the Sheikah slate. They also share some of the same part colors for items that change. The Master Sword in his tricks has been replaced with the Guardian Sword++. Unlike in Breath of the Wild, he is left-handed as well and uses his Skyward Sword voice actor. The other version of Link can still appear in a race even if Link has already been selected. Both can appear in a race if neither has been selected as well. Link appears as a Costume in Super Mario Maker. Link's, his toon counterpart's and Wolf Link's costumes can be unlocked by scanning their respective amiibo or randomly by completing the 100 Mario Challenge. The Link Costume is the sprite off the original NES The Legend of Zelda. The Wolf Link Costume also includes Midna riding on top of Wolf Link. A special Event Course titled "Tri Force Heroes" allows the player to play as, and unlock, a special Costume Mario called Totem Link, based off The Legend of Zelda: Tri Force Heroes. As Totem Link, players play as all three Links from the game (red, blue and green), stacked up on top of each other. Additionally, there is also an Event Course titled "Twilight Princess HD", which is based off The Legend of Zelda: Twilight Princess HD, where players can unlock Wolf Link. Link in Super Smash Bros.
Bio: Link is the valiant boy hero of "The Legend of Zelda" series in which he fights against the evil Ganon to recover the Triforce. Though his tools may change with each adventure, his strength and righteousness remain constant. With his trusty sword and a variety of weapons, he takes adventure head on! A sword-wielding hero who also boasts long-range attacks. Smash : Boomerang Burdened with a shield, a heavy sword, and plenty of equipment, Link is not a very mobile character. Nevertheless, he's skilled with the blade, and his varied supply of missile weapons makes him a powerful fighter. To master Link, you must control the pace by balancing your long-range attacks with head-to-head swordplay. Down & : Bomb Link's Bow, Boomerang, and Bombs all take time to wield, so you may want to try drawing them in mid-air to prevent your foes from attacking you while you're vulnerable. The Spin Attack can score consecutive mid-air hits, and the final slash is very powerful. Link's Bombs are his trump card, but he can't pull one out if he's carrying another item. Instruction booklet: A warrior from distant Hyrule. His sword and projectiles make him a versatile fighter. Website: The hero of The Legend of Zelda series. The design of this particular Link comes from The Legend of Zelda: Twilight Princess. Use all of his weapons to adapt to the ebb and flow of battle. WII The Legend of Zelda: Twilight Princess A young man who emerged to rescue Hyrule from peril. He's the bearer of the Triforce of Courage who fights to keep Ganondorf from conquering the world. His green outfit is a constant throughout the series. He's a skilled swordsman, horseman, and archer. He's also proficient with bombs and boomerangs. WII The Legend of Zelda: Twilight Princess Link's alternate form in the Twilight Realm. In this form, he cannot use weapons such as swords or shields, but he can attack with a ferocious wolf bite. He also has a number of unique skills inherent to his beast form, such as a keen sense of smell, the ability to dig, and a loud wolf howl. Snake: Otacon, who's the guy with the sword? Otacon: That's Link. He's the hero of Hyrule. That blade in his hand is called the Master Sword, also known as the "Blade of Evil's Bane." He also has a whole arsenal of items at his disposal--bombs and arrows, a shield, a boomerang, and a Clawshot. He's a force to be reckoned with. Snake: Gear is only useful when it's used at the right time and place. Just lugging a ton of it around doesn't do you any good. Otacon: ...I, uh... I wouldn't be talking if I were you, Snake. Snake: What's that supposed to mean? Otacon: You tell me, Mr. Utility Belt. SNES The Legend of Zelda: A Link to the Past (04/1992) NA: Green clothes? Pointy hat? Yep, it's Link, all right! In this game, his sword and shield make for effective attacking and blocking, and his bow, bombs, and boomerang will spice up any battle. He's even brought his Clawshot for grabbing enemies and edges. Jeez, just how much stuff can Link carry? EU: Green clothes? Pointy hat? Yep, it's Link, all right! In this game, his sword and shield make for effective attacking and blocking, and his bow, bombs, and boomerang will spice up any battle. He's even brought his Clawshot for grabbing enemies and edges. The hero of Hyrule is really kitted out for a brawl! (3DS) N/A NA: If Link was on a desert island and could only pick one item, it'd be his powerful sword. This weapon is key to his down-air attack, a move with great launching potential and the ability to strike twice. He can also strike twice his his side smash—the second blow deals more damage and launches harder. EU: Of all of his weapons, Link's sword may be the most lethal. His down air attack has incredible launching power. What's more, he'll bounce up afterwards, allowing for a follow-up strike. His side smash can also be followed up with a more powerful second blow that sends foes flying - just press the button again straight away. SNES The Legend of Zelda: A Link to the Past (04/1992) NA: If Link was on a desert island and could only take one item, it'd be the Master Sword. This weapon is a key to his down air attack, a move with great launching potential and the ability to strike twice. He can also strike twice with his side smash–the second blow deals more damage and launches farther. N/A NA: The children from Kokiri Forest never seem to grow into adults. Just a young boy, Link is entrusted with a quest by the Great Deku Tree. He leaves the forest and eventually finds the Master Sword in the Temple of Time. When he awakes, he is seven years in the future and an adult! EU: Link was once a carefree lad living with the Kokiri in Kokiri Forest, but one day, the Great Deku Tree entrusted him with an important task and he had to leave. His quest led him to find the Master Sword, and when he took it, seven years passed in the blink of an eye. Before he knew it, Link had grown into a young man! EU: Hold on a sec! Where's our dashing young swordsman? Oh... This IS him, just...in wolf form. When he steps into the eerie Twilight world, Link becomes this rough-looking beast! Luckily, he turns back into normal Link eventually, but with the Master Sword letting him transform at will, he might feel like going wolf again from time to time. NA: Link makes use of the Triforce of Courage to trap foes, and then he launches a 16-blow combo. The final, mighty blow has the power to launch opponents off the stage. When Link prepares the attack, the ray of light he emits must strike a rival, or the attack will fail. Shielding will do nothing to stop this powerful attack. Red indicates the Trophy or description is exclusive to the Nintendo 3DS version. Pit: Of all the fighters, Link is the one I most want to take down! Pit: We were born around the same time, and we both use a bow. He's totally ripping off my style. Viridi: Puh-lease! Comparing Link to you is like comparing a star to a campfire. Viridi: Just look at those chiseled features! His cheekbones could seriously cut glass. Pit: Uh, earth to Viridi! Viridi: Oh, I'm only kidding. The goddess of nature would never be interested in some hairless monkey! Palutena: Oh, humans aren't all that bad. I could introduce you to him, if you'd like. Viridi: Hmph. If you insist. Palutena: Back to the fight at hand. Pit, you can reflect Link's projectile attacks using your Guardian Orbitars. Viridi: Just watch out for his dreamy Clawshot! Otacon: That's Link. He's the hero of Hyrule. That blade in his hand is called the Master Sword, also known as the "Blade of Evil's Bane." He also has a whole arsenal of items at his disposal--bombs and arrows, a shield, a boomerang... He's a force to be reckoned with. Pit: I can't put my finger on it, but Link seems...different somehow. Palutena: Well, this Link is technically a different person from the Link you fought before. This incarnation is known as the Hero of the Wild. He was once Hyrule's Champion, but he fell into a 100-year slumber after using all his strength to fight the Calamity. Pit: 100 years might not be a long time to a goddess like you, Lady Palutena, but that's more than enough time for an entire world to change. Palutena: You're right, Pit. When Link woke from the slumber of restoration, not only was his world unrecognizable, he also lost his memory. Pit: I can't even imagine what that would be like. Lady Palutena, isn't there something the gods can do to help him restore his memory? Palutena: Meddling in the affairs of another world is never a good idea. Although I do like Link, and his swordsmanship is quite impressive. The Master Sword, also known as the sword that seals the darkness, reveals its true strength in the presence of the Calamity. Pit: Cool! Does that mean it's OP against Ganondorf? Palutena: No, Ganondorf is from a different game. You should really do more research before you jump into a fight. If you expect to win, you need to know your opponent's backstory and abilities. Link has a lot of different weapons at his disposal. Link's name appears on the scorechart of Mario Golf for the Nintendo 64 and Game Boy Color. Link, along with many other non-Mario Nintendo characters, was meant to appear in Mario & Luigi: Superstar Saga, at Starbeans Cafe; he would have given Mario and Luigi the Triforce. In the final game, all of the Nintendo cameos are replaced with Professor E. Gadd, and the Triforce is instead the Great Force. Link appears in Nintendo Monopoly. He takes the place of Pennsylvania Avenue, and costs $320. In the Club Nintendo comic "Super Mario: Die Verwandlung", Dr. Light constantly mistakes Mario for Link. One of these confusions also implies that Link has undergone an aesthetic surgery by Light. Though the Link in Mario Kart 8 is based on the incarnation from The Legend of Zelda: Skyward Sword, he is left-handed in Mario Kart 8, as opposed to his right-handedness in Skyward Sword, as most other Links in the Zelda games are left-handed. Out of all the dark characters in the Super Smash Bros. series, Dark Link is the only one who has yet to receive a playable appearance separate from his character of origin. ↑ Super Smash Bros. Melee North American instruction manual, page 42. This page was last edited on April 12, 2019, at 22:37.